We Care About Your Network Needs. More than often, we keep hearing the word ‘Structured Cabling’ thrown around like a jargon in the world of networking. But what exactly does the structured cabling refer to? In a layman terms, the structured cabling is the telecommunications cabling infrastructure in a building or a community. It has various smaller standardized elements called structures, which offer flexibility to add, remove, or change hardware with ease and is more streamlined in terms of performance. Based on the cable that is used for networking, there are structured copper cabling and structured fiber cabling. However, the requirement and the limitations of a company or a building, urges you to choose one of the preferred types of structured cabling. We are VRS Computers, who provide reliable structured cabling services to any organization who desire to have an authentic network cabling. We make sure that you get the best service that suits you- by visiting your company premises combining them with your concerns and requirements. Structured Cabling on a whole is a complex setup. However, having a better understanding of the cable types i.e. Copper Vs Fiber Optics can help you choose between the structured cabling that suits your specific requirement as each requirement is unique. A lot of planning and research goes into setting up a structured cabling network, however, once the initial hard work is done, the rest is easy. • Offers flexibility: Supports customization, it basically is flexible to any kind of additions, moves or changes. • Saves Install Time: There is a significant amount of reduction in the install time in the future set ups as it offers a lot of flexibility to make any sort of changes. • Neater and spruced up cabling: Proper planning enables cleaner and more efficient cable management that results in reducing the usage of bulk cables and congestion. • Power over Ethernet (POE): The copper cabling ideally offers you the ability to power the CCTV cameras, phones and the Wireless Access Points (WAPS) with the networking copper cables itself. There is absolutely no need to bring in an electrician separately to power these points. • Cheaper Electronic components: As the PC’s NIC cards come in copper, the copper cabling is easier to gel with, the fiber optic cabling will most certainly make the networking a costly affair. • Offers more Flexibility: The TDM environments are ideally made for copper infrastructure. Fiber optics adaptability will increase the cost. • Electromagnetic Interference (EMI): Fiber optical cable is immune to electro-magnetic interference, as glass is not a conductor of electricity, making it a potentially stronger mode to have uninterrupted communication. • Higher Bandwidth: Fiber optic cables have higher bandwidth than copper with the capacity to transmit 1000 mhz of data carrying almost 31,000 calls. • Non-flammable: Fiber optic cables are die-electric, which means there is no amount of electric current that flows through it, making it immune to fire accidents. • Secured: Eavesdropping is farfetched where fiber optic cables are concerned making it more secured form of data transmission. • Distance: The fiber optic cables can transmit data over longer distances as compared to the copper cables. The latter are prone to data loss while transmitting data over longer distances. • Resilience: Fiber optic cables are stronger than the copper cables, which can handle 100-200 pound tension. 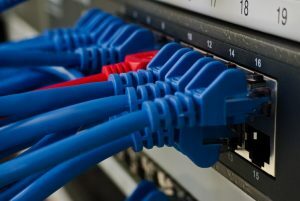 Visit our site www.vrscomputers.com for more info about our Structured Cabling Services. Contact us at +971-55-5182748 and discuss your requirement.